Audio quality The sound is surprisingly good. Powerful but not overwhelming bass and rich midrange. Calls are clear, too. Battery life These earbuds get very close to the advertised five hours per charge. Design They look like AirPods, sure, but the Liberty Air are comfortable and easy to carry around. Price These are an absolute steal at $80. Touch controls No single-tap controls. Skipping back is tricky. Case shape You can't use fancy foam eartips beacuse they won't fit in the case. Latency There's no low-latency codec support, so audio lag is noticeable (but not severe). No app The Liberty Air's hardware doesn't support app control. So, there are no settings and no way to update the firmware. 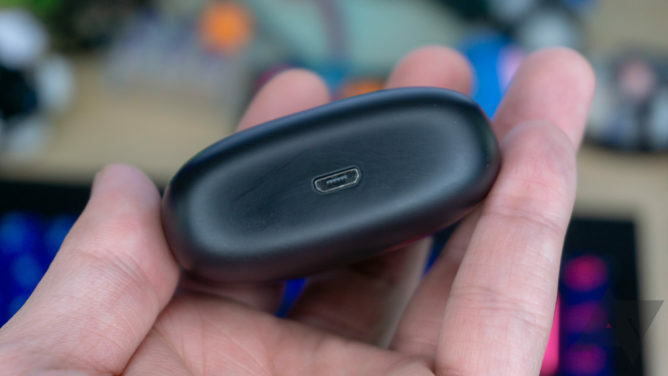 The Liberty Air doesn't try to hide its AirPod vibe. Not only do the earbuds themselves look like Apple's product, but the charging case design is also a dead ringer. The Liberty Air buds have a long stem that extends downward from the main body. The mic is at the bottom, and it seems to pick up audio well. People on phone calls could hear me loud and clear. There are no wings to lock the earbuds in place, but they are light and seem to stay put fine with just the in-ear tips. I don't love the glossy plastic housing because it almost immediately looks dirty. These are going in your ears, after all. The outer surface of the buds (when you're wearing them) is flat with a touch-sensitive section at the top. 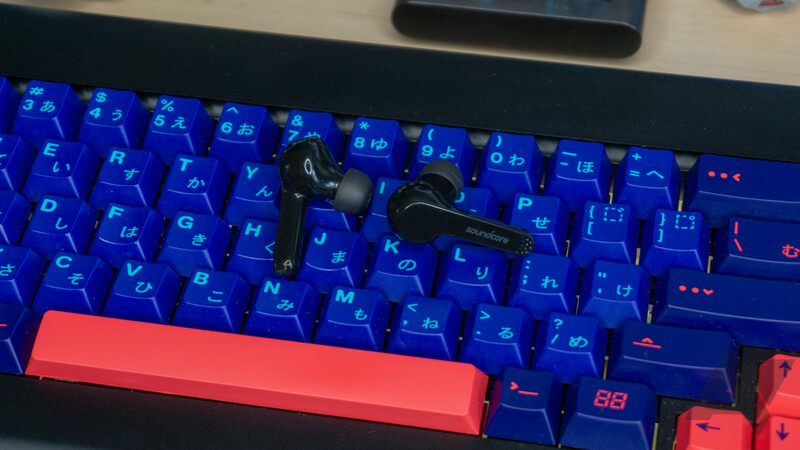 Sadly, the stem isn't a touch control for volume like on the more expensive TicPods Free. You can double tap on the right earbud to play/pause and on the left to launch Assistant. A long-press on the right skips tracks and the left goes back. The controls work well enough, but it can be tricky to go back to previous tracks in a playlist. You have to long-press twice in a row, so you just end up restarting the current track multiple times if you're not fast enough. Adding single-tap actions would free up controls for volume, but there's the risk you'll accidentally trigger things. 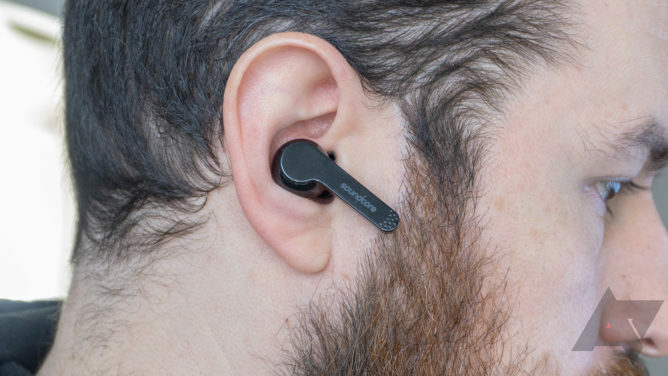 Personally, I'd take the chance as there are stems you can use to nudge the earbuds without getting anywhere close to the buttons. Pairing the Liberty Air was a snap: take the buds out, open Bluetooth settings, and select them. They remained connected reliably in my testing without any sync or reliability issues. The Liberty Air don't have sensors to detect when they're in your ear, but they do wake up as soon as you remove them from the case. 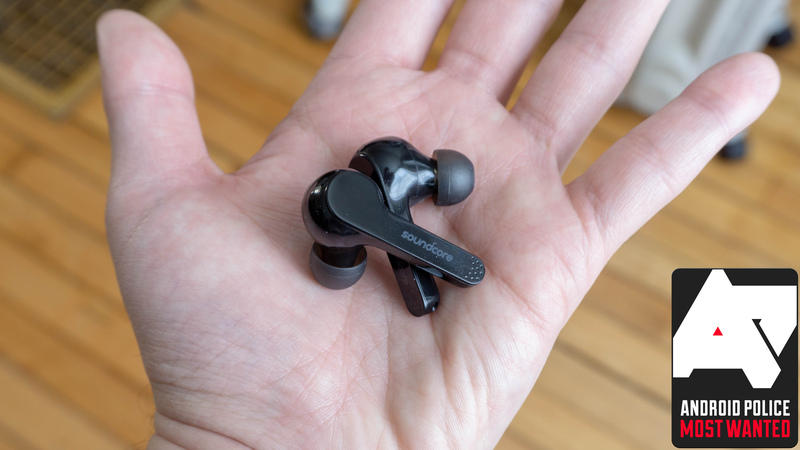 The smooth plastic also makes it easy to get the earbuds out and replace them when you're done. The charging contacts are way at the bottom of the slots. I'm a bit concerned that ear debris could get stuck down there and interfere with charging, but no problems yet. You'll have no trouble slipping the charging case in your pocket or bag. It's compact, and the lid stays closed even if it gets jumbled around (that was a problem with Anker's Zolo earbuds). 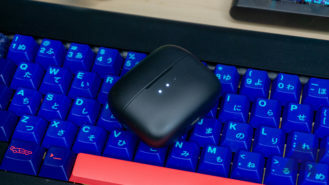 The case is rounded on all sides like the AirPod case, so it tips over if you try to set it down with the lid pointing up. The charging port is on the bottom, and sadly, it's microUSB. I'm not surprised to see that at such a low price, but it's still a bummer. You're also stuck with standard eartips—the Liberty Air won't fit in the case if you try to add fancy foam tips. They comes with four sizes of silicone tips, though. The only other accessory is a short microUSB cable. You don't get a lot of extras at this price. I've learned not to expect too much from true wireless earbuds when it comes to audio quality. Some are better than others, but too many of them are profoundly disappointing. There are a few pleasant surprises like the Master & Dynamic MW07 and Sennheiser Momentum, but those devices cost $300. Meanwhile, the Liberty Air cost a mere $79.99, and the audio quality is much better than I would have expected for that price tag. Bass is strong without being overpowering, and the mid-range sounds full and even. The earbuds have a good seal, which helps the bass. There's no design element to improve the treble, of course. For example, cymbal crashes sound a bit flat and lifeless, but the sound is still better than anything else in this price range. If you like a bass-heavy sound profile, you'll have to play around with your phone's EQ. The earbuds themselves don't have an EQ... or any settings at all. There's no app, and Anker says that's a hardware limitation. That means you're unlikely to get firmware updates, and you'll have to rely on the system UI for features like battery level. There's no aptX support for ultra-low-latency playback, which again, is a limitation of the audio processing chip. Audio lag is one of the first things I look for when trying a new pair of true wireless earbuds, and there is some detectable lag here. Anker says it's about 200ms; headphones with aptX can go as low as 40ms. You want to be sub-100ms (a tenth of a second) to keep audio synced with video as far as your brain is concerned. While the Liberty Air isn't quite there, it's not as bad as some true wireless systems I've tried. If you're not too picky, the Liberty Air is usable for watching video. Notice the subtle LEDs on the edge of each earbud to tell you they're charging. Luckily, you won't have to stress too much about the battery level. 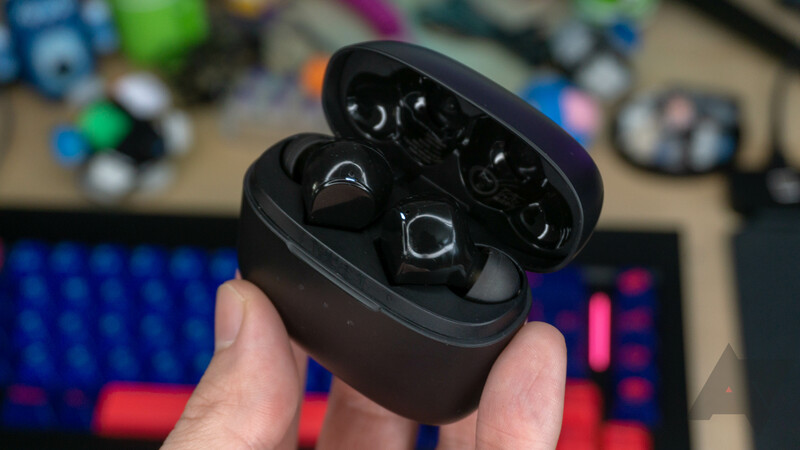 The Soundcore Liberty Air lives up to the battery life claims better than any other true wireless buds I've tested. Anker claims about five hours of playback per charge, and I'm seeing very nearly that long. I used the LibertyAir on a flight that was a bit over four hours, and they lasted the entire time with around 10% left when I landed. The charging case promises three more full cycles for a total of 20 hours before you need to find a charger. Yes. I do have a few reservations about the Liberty Air, but these earbuds are a killer deal at $80. The design is derivative, and it's a little light on features. I'd like to have an app, ear detection, and Type-C charging. That's a tall order in this price range, though. What you do get for the money are some comfortable earbuds with reliable connectivity and good sound quality. If you want the best true wireless earbuds, you'll have to look toward the likes of Sennheiser and Master & Dynamic. The Soundcore Liberty Air aren't as good, but they're within spitting distance for less than a third of the price. 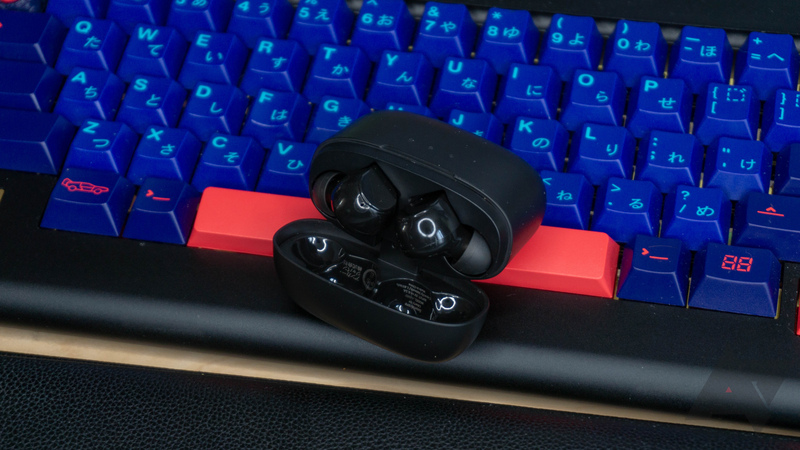 You want a solid true wireless experience and don't mind a few compromises to save money. You demand the best possible audio quality and don't mind paying for it.